He secretly started planning the occupation of Iraq from September 17, 2001, manipulated the issue right before the 2002 congressional race, and kept the public in the dark about the price tag until late 2003. His attorney general, John Ashcroft, would not let the FBI investigate terrorist suspects' gun buys—the NRA wouldn't like that—but sent out the FBI fifty times to demand public-library patron information. In both cases Ashcroft told his trademark give-no-ground yet highly embroidered fables as cover stories. The president rammed trillion-dollar deficit-financed tax cuts for the rich through Congress using statutory power intended only for debt-reducing measures, thereby abusing the law on the nation's highest budget governance. He installed his personal lawyer as an oversight-proof back channel in Riyadh, facilitating the darker aspects of diverting national anger after 9/11 from the implicated Saudis to the nonimplicated Iraqis. All these subversions of the law either were actively concealed or were buried by the White House's restricted, camouflaging, "daily message" system, so the public could barely even guess about its ruler's projects and plans. All presidents govern by political means, including at least some political uses of the law. In my eleven years (1984-1995) as solicitor of the House of Representatives, representing the House in court and in investigations, I participated in countless inquiries and analyzed from an insider's vantage point the many concealed, devious, but potent ways that presidents have made and might henceforth make such political uses of the law. In foreign affairs modern presidents have extensive legal powers and often act with at least some political considerations in mind. President George H. W. Bush used a secret Presidential Decision Directive to court Saddam Hussein in the late 1980s, inducing in Iraq the false impression that invading Kuwait might be all right, then refused, even after the Gulf War, to let the public read the whole directive to know how it all had happened. President Bill Clinton signed various international agreements he supported, on matters from global warming to the creation of a war crimes court, that a Republican Congress was in no rush to approve and that some considered usurpation of power. In domestic affairs presidents lack the vast freedom of action they have in foreign affairs, but they can still use law to reward their supporters rather than their opponents. President Ronald Reagan beefed up a tough "regulatory reform" office in order to please his business supporters by squelching regulation, setting back public-interest efforts for the environment and health for a decade. President Clinton conducted sweeping lame-duck actions in his final two months, from widely approved public-land protections to ill-considered pardons. We expect presidents to use the law in doctrines and strategies that push, and sometimes push very hard, the limits of their political—and legal—powers. But there are legal boundaries we do not expect or condone a president to cross for political reasons. When presidents exceed even the public's broad tolerance for their prerogatives of office, we scrutinize the motivations and implications of their acts for possible abuses of the law. Subversions of the law need not constitute breaking the law; they may just involve straining and manipulating it in a way that causes voters, if fully informed, to shake their heads and say, "That's bad; don't do that." Some actions, though often not criminal, constitute abuses of the law, such as use of the toxic waste Superfund as patronage by Reagan's EPA head, Ann Gorsuch, who then let subordinates shred the evidence rather than come clean; or the patronage-motivated firing by President Clinton of the White House Travel Office employees. But subversions also include enormous national scandals, far-reaching and hard-edged, exposing whole networks of rot and corruption at the top, like Watergate and Iran-contra. We accept a president's reaching for political power to provide some of what presidential supporters want, but not serving extreme ideological causes in ways that could distort the governance process in a long-term bid to put the extremists in power over the centrist majority. President Reagan had to drop his project to have Ollie North run right-wing foreign affairs projects, from deals to wars, with funds obtained from rich donors or duped "allies" and without even letting Congress know. President Clinton's "creative" new loopholes in campaign financing to fill his 1996 reelection coffers, although not intrinsically ideological, had the potential to give big donors with wish lists in their pocket a major say in the government; disclosure of these abuses in the campaign finance investigations motivated and enabled passage of the McCain-Feingold reform act of 2002. President George W. Bush entered office eager to accomplish a larger-than-suspected far-right agenda, delivering much more for his conservative bases than their limited political strength would seemingly sustain. Through political uses of the law and under the cloak of secrecy whenever possible, the president delivers for conservative causes in domestic affairs, from environmental rollbacks to the redirection of the judiciary, and in international affairs as well. This all raises the question: how much more of this will a Bush second term bring? The Bush administration's capacity to advance conservative causes impresses observers all the more because on their own these causes usually lack the strength to overcome centrist resistance. The National Rifle Association, the Christian Coalition, the top 1 percent of wealth holders in the country, and the industries seeking relaxation of environmental protections—each has its own substantial leverage, but none possesses the weight of a majority, or even a decisive plurality, of the electorate. Indeed, these organizations and groups, which are further from the nation's moderate consensus than even President Reagan's constituencies, would encounter difficulty achieving their goals by moving bills through the obstacle course of Congress. Aware of this, the administration uses other means to assist them. The 2000 and 2002 elections and polls before and throughout Bush's presidency show that his popular support comes mainly from his image, or "character," including his leadership after 9/11. Large majorities reject his conservative stance on issues such as his objections to Roe v. Wade and his proposals to drain the Treasury for tax cuts for the wealthy instead of husbanding resources to shore up Social Security, Medicare, and education. In 2000 President Bush's loss of the popular vote, the problematic Florida contest, and his party's loss of six precious Senate seats denied him a real mandate for conservative activism. Even in 2002 his party regained only two Senate seats, a margin much too narrow to push ideological bills past a filibuster. In international affairs his conservative causes have had to swim upstream against increasing international resistance instead of moving with the current of international legal systems. By 2003-2004 his cause of occupying Iraq under the legal framework of a "preemption" doctrine had largely isolated America from world support. And yet, instead of a presidency constrained by limited election mandates and world support and the limited popularity of his supporters' extreme causes, President Bush proved ready and able to do a great deal for the Republican Party's most conservative social and economic bases. How? Deft ordinary political maneuvering and an element of fate played their roles in enabling Bush to go so far. But this book focuses on a far more important, interesting, and troubling aspect of the Bush administration's effectiveness: its political use and sometimes abuse of the law for conservative political causes. President Bush's new uses and abuses of law tap power sources independent of democratic political struggle on the floor of Congress. These include administrative, judicial, and foreign-affairs powers, as well as legal mechanisms within Congress that sidestep its normal processes. To maneuver around the absence of centrist support for conservative causes, the president depends on his augmented powers in international and national security matters; his scope for manipulation in domestic affairs, such as environmental regulation and campaign finance law; the support of the Supreme Court's conservative bloc of five, reinforced by an increasingly conservative lower judiciary; legal manipulation of other governance processes, from federalism to budget action; and smokescreens such as the official daily presidential "message," shielding the administration's actions from congressional questioning and other criticism. Of course, the attacks of September 11, 2001 were not the president's specific fault, nor did he respond to them in a purely partisan way in the short run. Yet they initiated a climate of urgency and secrecy that added powerful new tools and strengthened old ones in the administration's arsenal for accomplishing ideological goals. Taken together, these tools have allowed President Bush to leverage his powers away from the legislative process, which requires coping with Senate rules that enforce moderation, and to act in ways shielded from congressional oversight and criticism. His course of action depends upon keeping the American public unaware of polices it would not fully support, and he has achieved such secrecy. Rather than seeing President Bush's various tactical maneuvers as scattered and unconnected, this book analyzes his approach as a unified, if flexible, program of the political use of law. I start with an examination of the conditions that gave rise to President Bush's desire and capacity to follow this new course. Two distinct conservative constituencies sought to achieve noncentrist goals: social conservatives sought mainstream legitimacy for their various culturally restrictive and religiously oriented causes, some on the fringes; economic conservatives sought to increase the wealth and power of those in the very top tax brackets and felt that business should be "taken care of," as through a relaxation of environmental, safety, and other regulations. Neither conservative base, however, commanded the strong political support needed to roll over opposition in the open legislative arena, particularly in the Senate. There, the balance and the polarization of post-1990s politics meant that each party had the forces to block ideological legislative proposals and to curb, through criticism and oversight, the more extreme ideological initiatives of the other party's outer wing. Yet the rise of the conservative bloc of five on the Supreme Court, along with developments such as the lapse of the scandal-investigation machinery that had scrutinized Washington from Iran-contra to Monicagate, created the potential for a president with the requisite determination to serve those conservative groups. Finally, the background of the incoming president prepared him for the political uses of law. Even before taking public office in Texas, he used his law firm's connections, set up by the appointments of the senior President Bush, to fend off the SEC's insider trading case against him. As Texas governor, he mastered the art of offering legal favors to conservative business interests in exchange for receipt of massive campaign contributions. In a critical step for Bush's implementation plans, he chose John Ashcroft to head the Justice Department. Chapter 2 begins with an analysis of Ashcroft's rise in the social conservative movement. Ashcroft used religiosity and race-baiting to build his political career, the latter most blatantly in his derision of a respected African American jurist as "pro-criminal" during a key 1999 Senate battle. Yet after being appointed attorney general in the Bush administration in 2000, Ashcroft's extreme notions were given relatively free reign. His ideological patronage for conservatives included the president's 2004 campaign poster of a late-term abortion statute, manipulated as a tool for undermining Roe v. Wade, and the president's fateful shift in 2004 to a stance of intolerance and manufactured confrontation with the courts on gay rights. Chapter 3 explores Ashcroft's supplication to the NRA on a national personal right to weaponry, even when doing so potentially imperiled national security. His 2003 implementation of the misnamed USA PATRIOT Act turned the most dangerous privacy- and liberty-threatening central government superpowers, intended only for fighting large-scale threats, against mere garden-variety crimes. Invoking his right to surveil library records of books taken out by patrons and Internet material accessed at libraries, Ashcroft pushed for a further erosion of civil liberties, cavalierly dismissing citizens' rights to personal privacy, one of the nation's most cherished values. Further, he fueled Bush's effort to stack the federal judiciary with lifetime far-right appointments, with enormous future implications for democratic governance. Chapter 4 takes an in-depth look at how President Bush sought to move domestic policy to the right by using and sometimes abusing the law for political reasons. Bush had no higher goal than to shift the balance between rich and poor by regressive, trillion-dollar top-bracket and estate tax cuts. Ordinarily, the Budget Act facilitates only those presidential proposals paid for by spending cuts, but President Bush abused the law in 2001 and 2003 by using the facilitated track for his program without paying for it. Further subversion may occur when, starting in 2005, his program's implementation schedule contrives that an increasingly large alternative tax will fall on middle-class Americans living mainly in the major Democratic-leaning states. On another key domestic issue, environmental regulation, President Bush implemented a stealth approach. Interior Secretary Gail Norton and her staff of lawyer-lobbyists ran the public's resources and its pollution controls like a candy store for pariah industries. Chapter 5 examines the huge success of Bush's domestic gambits for big money, which paid off in 2004 with a historically large campaign war chest as a quid pro quo for favors rendered. Even the implementation in campaign finance of the McCain-Feingold legislation couldn't prevent Bush's aggressive tactics in "coordinating" the use of huge financial resources to achieve electoral goals. His agenda included the ruthless push for redistricting, most egregiously showcased in DeLay's manipulation of the Texas legislature to create more Republican congressional districts in the state. Bush also presided over a formidable dismantling and weakening of regulatory agencies, with his staff even developing a "tool kit" for using White House legal power against individual legislation. Chapter 6 discusses international and security affairs. In this context presidents have great scope for initiative and hence for the political use of the law. President Bush's approach started with nullifying international legal regimes, ranging from arms control to global climate control and international tobacco regulation. And he secured, on the most partisan terms, fast-track authority to make trade deals, taking a hard line against environmental, labor, and other social concerns. This means the prospect in his second term, via the Doha Round and talks toward a Free Trade Agreement of the Americas, of establishing powerful global engines that export jobs and serve conservative economic ends. President Bush also cranked up the legal theory of unilateral preemption," the focus of chapter 7. This strategy allowed him to control and time the issue of Iraq to suit his 2002 political agenda at the price of creating the worst international isolation in American memory. His unilateral approach catered symbolically to his party's conservative bases and exacerbated the alienation of world support—support won in the Gulf War by the first President Bush and in Yugoslavia by President Clinton. Government secrecy warrants its own discussion in chapter 7. For President Bush to attain conservative goals by the political use of law, he vitally needs to fend off congressional criticism and legal oversight. An early demonstration of the new secrecy came in his lone formal executive privilege claim, which was resolved in the end by a showdown at a House hearing in March 2002 where I had the honor of giving the key testimony on the legal issues. In the international arena, the new secrecy proved essential in letting the president control the homeland security and Iraq issues, so that his own purposes, not those of the public, were served in the run-up to the 2002 and 2004 elections. Bush's use of his personal lawyer as envoy to Saudi Arabia provided a channel that, because it was beyond the scrutiny even of his own State and CIA heads, was well adapted to coordinating the redirection of post-9/11 action from Riyadh to Baghdad. Domestically, the secrecy proved equally vital for such efforts as pushing exploitation of public resources. The final chapter presses the analysis to a conclusion. President Bush has harnessed effective legal means to accomplish conservative goals in ways that leave him much latitude for the future. The road ahead may provide further opportunities for conservatives to achieve previously unimaginable successes. In one scenario President Bush could hit the short-term jackpot by expanding his Senate majority while appointing several conservatives to the Supreme Court. Together these would allow a coordinated multibranch drive to bring major far-right aspirations to fruition. The increasing push to the right could become irreversible through the combination of massive campaign financing by the well-heeled and the increasing conservatism of the courts. But if the tension increases between the use of the law to serve political and ideological goals and the centrist desires of the electorate, an electoral and congressional backlash could develop. A number of administrations have faced major meltdowns or scandals in their second terms—for example, President Johnson's Vietnam, President Nixon's Watergate, President Reagan's Iran-contra, and President Clinton's Monicagate. These failures reflect a number of factors that trap presidents in their second terms, as their administrations forgo the political discipline previously self-imposed to win reelection while charging forward after election toward even more distant goals. Similar factors could operate during the years after 2005. And now, first things first. Events leading up to 2001 help explain what happened next. These are the focus of chapter 1. 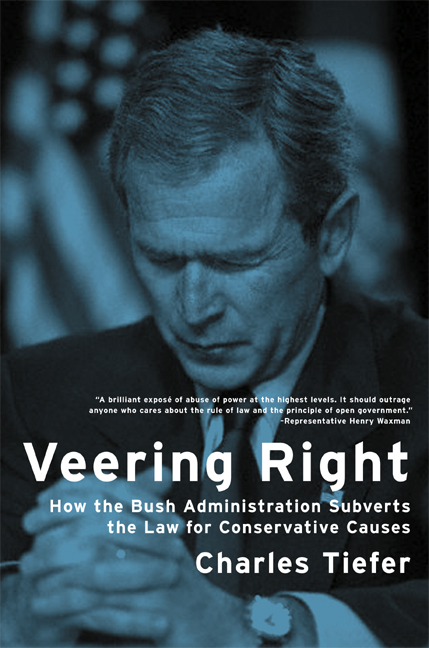 In this searing indictment of current administration policy, Charles Tiefer, a distinguished scholar of national legal affairs and former solicitor of the House of Representatives, argues that President George W. Bush methodically manipulates the law to promote right-wing causes. The beneficiaries of these machinations range from frontline pro-weapon and anti-women's rights groups to major industries that profit from lax environmental standards and military intervention in resource-rich regions. Accessibly written, legally rigorous, and meticulously documented, Veering Right demonstrates how the administration's already-ample arsenal for accomplishing ideological goals was expanded with weapons such as Attorney General John Ashcroft's social crusades and the polarizing 2004 election campaign. Tiefer lays out a compelling case for how the administration consistently erects barriers to media and congressional oversight that might expose covert motivations to public scrutiny. With an eye on the future, the White House is building a durable and potentially dominant machine for pursuing ideological goals by awarding lifetime judgeships and by exchanging favors for campaign funding. This book presents eye-opening evidence that ultra-conservatives could achieve previously unimaginable successes during a second Bush term. Charles Tiefer is Professor of Law at the University of Baltimore. As Solicitor of the House of Representatives from 1984 to 1995 and Assistant Senate Legal Counsel before that, he represented both houses of Congress and conducted investigations on domestic and foreign affairs under four presidents. He is the author of three previous books, including the classic 1,000-page manual of congressional procedure, The Semi-Sovereign Presidency (1994) about the previous President Bush, and dozens of respected legal articles. 3. Flouting Civil Liberties: Libraries or Weapons?